No doubt fracking creates jobs, just look around West Texas. Jobs are great, much better than the alternative. However, understand clearly that the short term gain from fracking jobs is going to have a long term cost when water, land, and quality of life is gone. “It’s the flowback stupid!” A refrain we have echoed after testing confirmed carcinogens present in drilling mud/flowback pits. There are literally tens of thousands of these toxic waste sites all over this state. Some day these “toxic” chickens will come home to roost, then What? Is Berry drilling for water in Gardendale? This rig is located on Poppy in Gardendale. Is Berry drilling for water in Gardendale? The pit by the rig is unlined. 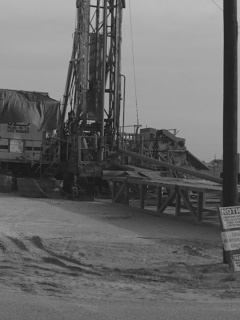 A local water well company is doing the drilling. This appears to be a deep water well rig. We have asked Berry’s PR firm, the KGB of San Antonio, Texas to clarify on their website http://www.commongroundgardendale.com. Cristi Craddick for Texas Rail Road Commission! What? What does Ms. Craddick mean when she says we should “Protect individual private property rights An individual’s right to own property is afforded to us by the Constitution and should not be infringed upon by the government. Occasionally, energy exploration and an individual’s private property rights collide. When faced with such a conflict, it is vital we have leaders who understand how to balance the energy needs of the state with the constitutionally protected rights of private property owners.” quote from Ms. Craddick’s website. In this video of July 12th, 2012, a gas flare located next to a tank battery, (yes fire next to a battery of tanks containing flammable liquids) somehow fell over igniting the surrounding area. Flames shooting 100 feet in the air endanger families who live a mere 100+ feet from this facility. Those families, by the way, did not move next to the oil and gas; the oil and gas moved in next to them. Gardendale Texas will be a “hot spot” for this kind of negligence for as long as these operations are allowed to be so close to people. Ari Phillips Journalist and graduate student writing for Good magazine on July 12, 2011. As I approach Midland, Texas from the southeast the rolling hills give way to large, engine-revving trucks, their menacing grills reflecting the setting sun into my rearview mirror. The asphalt beneath my white Toyota Corolla seems to be melting into the petroleum-laden ground from which it had emerged: Not even the road was prepared for the heavy vehicles that showed up with the recent oil and gas boom. My plan for the summer is to report on the important energy and environmental issues in the Southwest where I’ve spent most of my life. With frugality in mind, I’d arranged to spend my first nights on the road in the town of Odessa in the spare bedroom of a middle-aged couple I’d found on Couchsurfer.org. My hosts informed me that the nearby suburb of Gardendale was a flashpoint for oil drilling gone wild. A few quick searches and there it was: The Gardendale Accountability Project, a community effort of about 30 members to document the actions of oil and gas companies in Gardendale. Their website, GARDAP.org, provides an outlet for distressed citizens to share their experiences dealing with the oil industry. I filled out the website’s contact form and moved onto another investigation: my host’s pantry. Before I even finished my Honey Bunches of Oats, I’d heard back. We made plans to meet for dinner two miles down the road. “We used to be all ‘Drill baby, drill’ until it came into our neighborhood,” says Paul Wood between bites of greasy Thai food. Wood, a small business owner and influential member of GARDAP, is easygoing and eager but with a bit of a wandering mind, like a cartoon hero’s sidekick. His mustache, oversized sunglasses, Hawaiian shirt, loose jeans, and boots give the impression of a modern-day cowboy whose parents let him watch too much Magnum P.I. After Berry Petroleum Company drilled a well on his property, Wood wanted to know what remained in the drilling pit, the area in which flowback from the fracking process is left out to dry before being buried. Wood had a sample tested by a third party, Xenco Laboratories, the results of which showed more than just mud and cuttings. Benzene, a known carcinogen, was present at 206 parts per billion. The EPA’s maximum contaminant level for benzene in drinking water is five ppb. Other possible carcinogens, an EPA classification of carcinogenicity beneath known carginogens, included xylene isomers and naphthalene. Because of this Gardendale has no ordinances dealing with where drilling can or cannot take place. Nearby Odessa has an ordinance that prohibits drilling within 150 feet of a residence while Midland prohibits drilling within 500 feet. To give me a better image of the impact this has, Wood offers to take me up in his two-person plane for an aerial view the next day. From the ground Gardendale is made up of low, hardscrabble vegetation holding fast to sandy soil. Occasionally a tree or minor structure impedes the flat expanse. The people living there like to feel as if they are still out on the range, and most lots are counted in tens of acres. The next morning Wood gently pulls the single prop plane out of the garage and onto one of the three runways he’s worn into his property. The plane’s interior is compact, and after struggling to get in I struggle further to find a place to put my bag. Any similarities to commercial flying ended there; the flight was more reminiscent of a jenky amusement park ride. From the air, I see derricks within 100 feet of homes, moats of mud discharge and drilling mix surrounding a massive drilling rig and rows of caliche patches pockmarking areas of past mineral excavation. One of the most unsettling views is a pit full of water to be used for fracking. West Texas is already suffering serious water shortages and these immense reservoirs of clean water go not to people or agriculture, but to freeing fossil fuels thousands of feet underground. GARDAP is not set on taking on the oil industry. In fact, the industry is the longtime employer of many of its members. For them, the industry’s conduct is a concentrated community issue. Wood gets visibly distressed and starts energetically gesticulating when recounting how he’s been lambasted as being anti-drilling—because he’s not. He’s against drilling happening in neighborhoods like Gardendale when it doesn’t have to. This is the first of four pieces exploring energy and the environment in the American Southwest. Truth IS the most powerful weapon of the righteous. If a thing is not true, the walls surrounding the argument will crumble, but if a thing is true, it’s foundation is unshakable. Does your local government care? On Thursday, June 28, 2012 a member of Gardap and a visiting journalist spotted the spill in Southfork Odessa from the air while on an aerial tour. The spill looked like oil (later pronounced to be ‘produced’ water). Photos were taken. That same day a copy of an aerial photo and the general location was sent to all of the county commissioners, the county judge and odessa city council members. In addition, most of the local media outlest were notified. The next day, Friday the 29th, a member of Gardap, knowing some of the residents of Southfork, ventured out with them and pinpointed the location of the spill. The TCEQ was first notified by a resident of Southfork. The TCEQ referred them to the TRRC ‘unless it catches on fire’. The TRRC send out a representative who then notified Devon. To date, I, the author of the aforementioned notiification e-mails, have not heard back from anyone save a single note from the Midland Reporter Telegram asking the specific locaton of the spill (which we did not know at the time). On Friday June 29th CBS7 was notified by myself and offered the story. They quickly moved to cover it. Since then the Odessa American has printed two stories regarding the spill. I suppose the aerial photographic evidence submitted to the county commissioners and the city council of Odessa was not enough to stir their interest. Of course it could be that they simply don’t read their e-mails often. Idle speculation does not serve any of us well. First, we did not contact the TCEQ or the TRRC until Friday because we did not know where the spill was. Secondly, had we contacted them what would we have said? “There is a spill somewhere south of Odessa.” Gardap is a group of landowners in Gardendale. We don’t live in Southfork and weren’t ‘on a mission to find spills’. We were giving an aerial view of the development of oil and gas to a young, Austin based journalist. We are amateurs! The bigger question is now that your Ector County and Odessa city officials know of this spill and its magnitude (13,000 barrels-200 of which were recovered according to CBS7 and the OA) what do they intend to do to about the water in Southfork? I think the county health department should at least sample the surrounding wells around the spill. It will be a mistake to let Devon be its own policeman. FYI, Gardap does have a sample of the water taken on Friday June 28th being kept in refrigeration. We will have it analyzed if we cannot obtain sample results from the TRRC and their report on the spill. It is also time to scrutinize the TRRC rules about cleaning up spills. First, collect standing water; Second, mix up the mud with dirt to dry it out. Cover the whole mess up with clean dirt and call it remediated. At this point the oil company can say they followed environmental regulations! Who among landowners living on land believe this is adequate? Oh yes, if the oil company doesn’t do it fast enough they will get a fine. How much is the fine? Several hundred dollars? The truth is that We The People are on our own! Which of your politicians stand up for landowners? For the most part as long as unemployment remains low and money flows into their election coffers they don’t seem to be concerned about much else. The day will come when the water supply of a major city in Texas is contaminated by inadequate and lax oversight of the oil and gas business but it will be too late!